The University of the Fraser Valley men’s and women’s golf teams posted matching second-place finishes at the Camosun College Invitational at Victoria’s Bear Mountain Resort on the weekend. The Cascades men’s team combined for a two-day total of 575, leaving them 21 strokes back of the host Camosun Chargers (554). The UBC Okanagan Heat took third (580). The result enabled the Chargers to expand their overall lead through three of four PacWest conference events – they’re at 1,728, ahead of UFV (1,775) and UBCO (1,796). Connor O’Dell was the top Cascade on the weekend. The 2014 CCAA All-Canadian from Maple Ridge followed a round of 70 on Saturday with a 69 on Sunday to finish at one-under, good for solo fourth place, three strokes back of winner Jeff Riches of Camosun. Rookie Nathan Bahnman, in his first tourney as part of the Cascades’ five-man team roster, tied for ninth with a two-day total of 145. Zach Olson (12th place, two-day total of 146), who won last week’s KPU Invitational, Connor McLellan (T14, 148) and Cody Stewart (17th, 150) rounded out the UFV contingent. “I was pleased to see us take some big strides this weekend in terms of some individual performances and our overall team score,” Cascades head coach Chris Bertram said. “We’re getting stronger as we build towards our ultimate goal, which is to be ready for our national championship. On the women’s side, Hannah Dirksen followed up her individual win at last week’s KPU Invitational with a runner-up result at Bear Mountain. She carded rounds of 78 and 77 to finish three strokes back of Carolyn Lee of UBCO. UFV’s Jennifer Kell (two-day total of 180) was fifth, and Ciara Melhus (190) was sixth. The UBCO Heat finished atop the women’s team standings at Camosun, firing a combined score of 313 to edge the Cascades (335). They’re 29 strokes up on UFV in the cumulative season standings (984 to 1,013). “It was nice to see Hannah continue to play well on a very difficult golf course,” Bertram said. “She continues to show the kind of maturity and development we’ve been hoping for. The Camosun tournament was the last road trip of the fall season for the Cascades golfers, who host a pair of high-profile events in the coming weeks. This weekend, Oct. 3-4, UFV hosts the fourth and final PacWest conference tourney at Chilliwack Golf Club. It tees off at 11 a.m. on Saturday, and Sunday’s action will begin with a shotgun start at 9 a.m. The CCAA PING Golf National Championships run a week and a half later, Oct. 13-16, also at Chilliwack Golf Club. It will be UFV’s first time hosting CCAA golf nationals, and the event will draw teams from coast to coast. 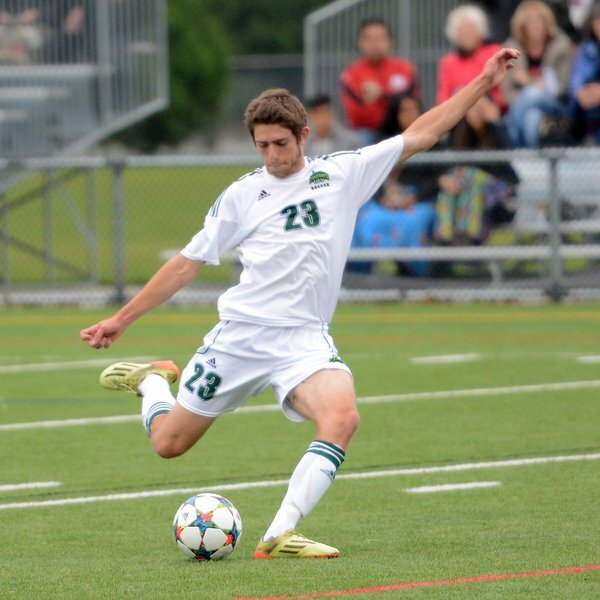 The University of the Fraser Valley men’s soccer team wrapped up a weekend sweep of the UNBC Timberwolves, earning a 3-0 win in Prince George on Sunday afternoon. The Cascades, coming off a 1-0 victory over the T-Wolves on Saturday, got goals from Daniel Molendijk, Colton O’Neill and Brady Weir. Keeper Alex Skrzeta made five saves for his second straight shutout and third of the season, tied for the most in Canada West. UFV improved to 4-2-0 on the strength of their third consecutive win, and they sit third in the Pacific Division of Canada West. Seventh-place UNBC fell to 1-5-0. “It’s a tough place to come – they always make it difficult for us,” Cascades head coach Tom Lowndes said. “We started a little bit slow again today. But as the game wore on, we kept the ball and did the things we wanted to do. We scored a couple goals, and it was pleasing to see. Molendijk opened the scoring in the eighth minute. Cascades captain O’Neill took the ball up the wing and cut it back to the middle to Molendijk for a tidy finish. O’Neill doubled the lead in the 61st minute. Cascades midfielder Mason Thompson was taken down in the box by T-Wolves defender Dan Goodey, who picked up a yellow card, and O’Neill stepped to the spot and picked the top right corner. Skrzeta did his best work in the 80th minute, diving to his left to stop a free kick by James Stephens and then parrying Gordon Hall’s attempt on the rebound. Goodey picked up his second yellow card three minutes later, reducing UNBC to 10 men and blunting their comeback hopes. Weir, a rookie from Pitt Meadows, B.C., rounded out the scoring in the 90th minute. With the T-Wolves pressing forward, the Cascades caught them with a lightning-quick counterattack that saw three UFV players taking on two UNBC defenders. James Najman took the ball into the box from the right wing and found Weir steaming down the middle, and he tapped it home for his first career Canada West goal. Justin Sekhon picked up game MVP honours for the Cascades. The fourth-year midfielder was dangerous throughout, and registered a team-high four shots. The Cascades return home for a pair of games at Abbotsford Senior Secondary next weekend. They host the UBC Okanagan Heat on Friday, and the Thompson Rivers WolfPack on Saturday. 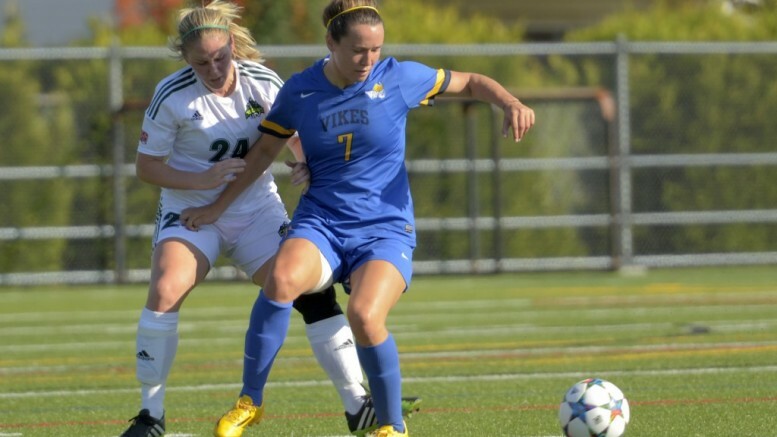 The University of the Fraser Valley women’s soccer team flexed its offensive muscles on Sunday afternoon, beating the UNBC Timberwolves 6-1 in Prince George. The CIS No. 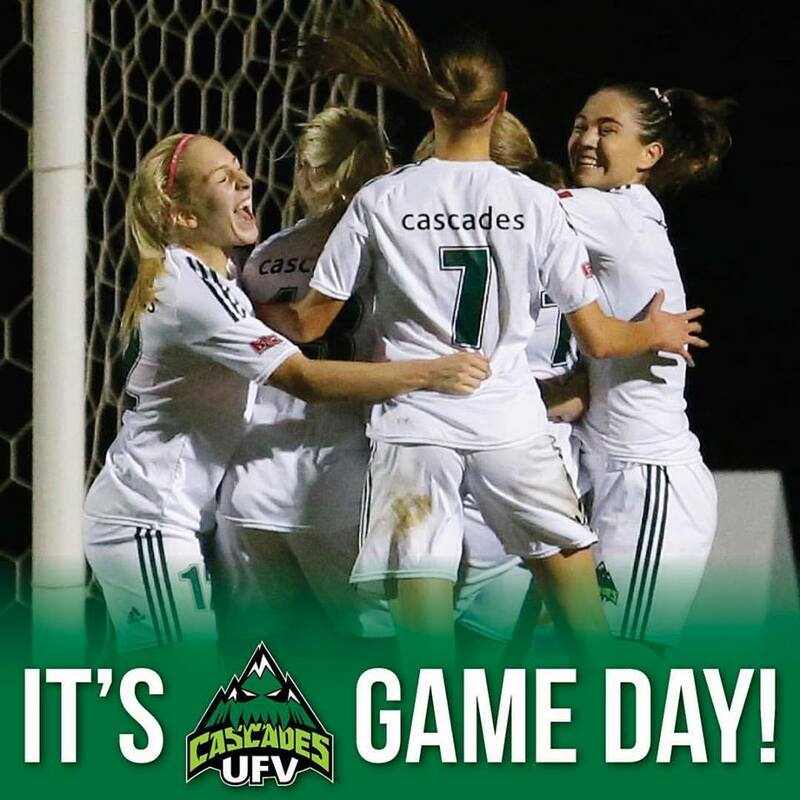 6 Cascades turned in a performance worthy of their lofty national ranking, highlighted by two goals from Monika Levarsky – her team-leading third and fourth of the campaign – and singles from Brittany Zacharuk, Jade Palm, Amanda Carruthers and Gurneet Dhaliwal. Emily Harold, UFV’s backup goalkeeper, got her first start of the regular season and made eight saves in the victory. Sydney Hall, in the 60th minute, was the lone UNBC player to solve her. The undefeated Cascades improved to 5-0-1, while the T-Wolves dropped to 0-5-1. The offensive output was one goal shy of a program record – the Cascades women’s soccer team had scored seven on three prior occasions in Canada West regular season action (Sept. 15, 2007 vs. Regina; Sept. 27, 2008 vs. Regina; Sept. 16, 2012 at UNBC). “It’s always tricky up here,” said Cascades head coach Rob Giesbrecht, whose team was coming off a 2-0 win over the Alberta Pandas on Friday. “UNBC is an improving team – they work really hard, they’re well-organized. You’ve really got to get on it early. We had some good chances in the opening minutes, but we weren’t able to score, and it was back and forth a little bit. Zacharuk, a rookie midfielder from Delta, B.C., got the ball rolling in the 31st minute. She made an aggressive run to the far post and banged in her first career Canada West goal off a feed from senior striker Shelby Beck. The Cascades’ second goal came just over a minute later, with Beck the provider once again. She played the ball through for Levarsky, who powered through the T-Wolves’ defence and slotted the ball home. Beck now has four assists on the season, tied for second in Canada West. Fifth-year right back Palm notched her third goal of the season, and second in as many games, in the 44th minute, rising to head home a perfectly placed corner from Sunayna Samra. Carruthers and Dhaliwal (her third of the season) tallied early in the second half to make it 5-0 before Hall got UNBC on the board. Levarsky rounded out the scoring in the 69th minute. Giesbrecht also lauded the play of Samra and Harold. Samra has provided terrific service to the Cascades’ attackers this season while upping her physical game in the midfield. As for Harold, the presence of fourth-year standout keeper Kayla Klim means playing time is tough to come by, but she performed admirably on Sunday. This coming weekend, the Cascades make a road swing through Alberta. They’ll face the MacEwan Griffins in Edmonton on Saturday and the Mount Royal Cougars in Calgary on Sunday. Both games kick off at noon Mountain time (11 a.m. Pacific).